I've worked on this for some time, and believe I'm "getting there" with the following numbers. Fortunately, with a lot of good information from The Henry Ford, Trent Boggess, Carl Pate and others I hope I'm getting this right. I really need to thank Hap too, as one of his email (that I finally read a few days ago) helped me dig into a few numbers I was having problems with. For 1906 I don't have a year end audit report as with 1907 and 08. 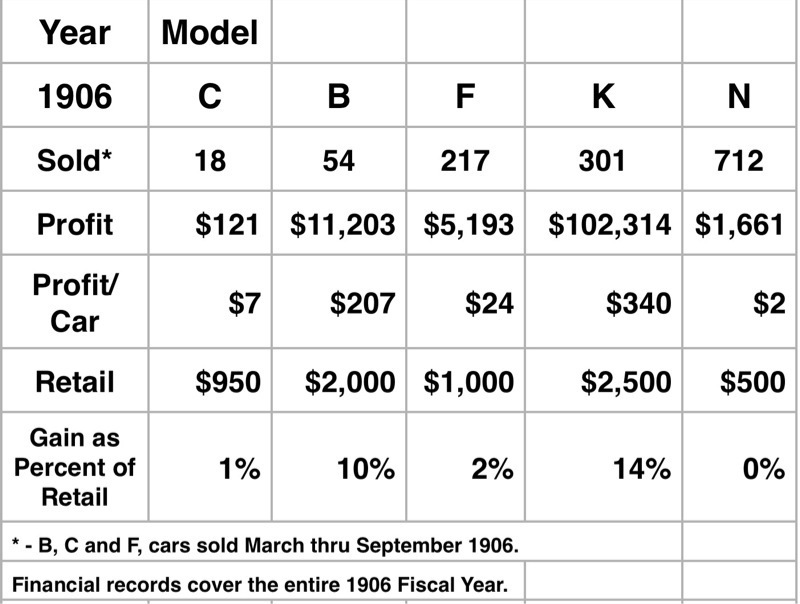 However, I do have the monthly reports in the same format, and so had a final year end total (dollars of sales per model), but I didn't have the correct number of Model F, B and C for 1906. Fortunately, Hap sent an email with some of Trent's work published on the Early Ford Registry in 2005 that helped "fill in the blanks". So, here goes. I thought these numbers quite interesting, and will make a few notes following each year. I reserve the right to be totally incorrect, to have "fat fingered" numbers, or ran the calculator incorrectly. Remember, you get what you paid for (and you paid nothing). A couple of things about FY 1906. With so few Model N sold, and having taken so long to move production along, my assumption is there were many production costs that had to be applied to the first 700 cars sold, and that is why FMC audit records look so dismal (of course, I'm not an accountant or auditor, so just guessing). 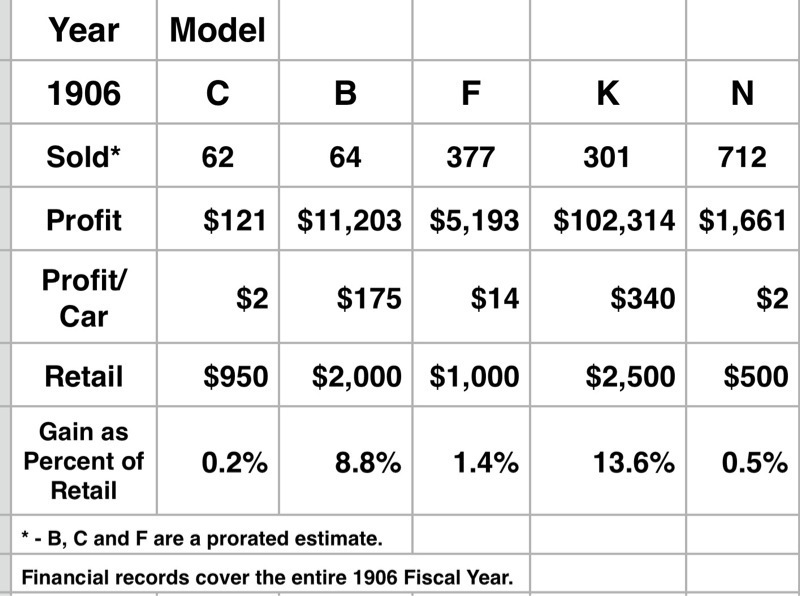 My guess on Model C is more of the same, an older model that may have expenses against the few remaining cars, and possibly greatly reduced revenue to get them sold? It certainly looks to me as if the Model K really was the standard bearer for FMC in FY 1906, like it or not. 1907 looks to me like a "breakout" year. Even though the U.S. was in a recession, all three of Ford's primary models, K, N and R were tremendously profitable (compared with past years). For a "transition year", it looks as if Ford was cruising into the Model T era in great shape. Even though the rumor of the Model T had been around since late 1907, sales of the new Model S Roadster were great, and profits from the remaining models (S/N Runabout and K) were solid. Unfortunately, while I have the production numbers for FY 1909, I don't have the financial information model by model. My assumption is that just as with the Model B sales in 1906 and 07, models K, N, R and S were still profitable. However, I don't know that for a fact. I do know Ford reports a 2.7 million profit for FY 1909, but don't know how that is distributed by model. Obviously this is hugely interesting to me, and I hope anyone reading this finds it interesting too. It is a work in progress, so please, point out any glaring deficiencies or additional information, within reason. I'm sure I've made mistakes, and this is not meant as a publication or reference, just my notes and observations. It must be said that the Model N profits are not only to Ford Motor Company. They were shared by Ford Manufacturing company. Similarly, the profits for the Model B,C,F,K were shared by Ford Motor Company and Dodge Brothers. Since Ford Manufacturing was just starting in 1906 it is likely there were not much in the way of profits for the first year due to tooling, shop equipment, furniture, etc. However, unlike money sent to Dodge Brothers, any money spent by Ford Manufacturing would be money that would yield an investment for years to come. I've never seen a Model K that was identified as anything other than either a 1906 or 1907 model. Would the Model K profits for 1908 therefore be 100% since the cars were all built as 1907 models? Or did Ford's accounting department simply accrue cost at the point of sale, and not charge it to inventory until POS? Don't make assumptions, then "assert" they are facts by asking follow on questions. It's disingenuous at best. Ford Manufacturing profits have nothing to do with FMC. the same applies to Dodge Brothers, Briscoe (radiator), Firestone, Gray and Davis, Wilson Body Company, Ball Bearing Supply, Holly Brothers, Buffalo, McCord (oiler), steel, brass, wheel and a myriad of other suppliers. FMC contracted with each supplier (as did all other auto makers to one degree or another, as you well know). As with any healthy business relationship, each partner had to receive a profit in order for the endeavor to remain successful. FMC arranged for delivery of chassis from DB (K) and Ford Manufacturing (N) on a month by month schedule. The conditions and timetable were subject to change as terms of the arrangement (FMC board minutes). Expenses were fluid, and changed by model by month (FMC audit reports). The bottom line is as reported above. These numbers were audit reports for internal FMC use. future business decisions, including dividend payments to stockholders, were based on these numbers, so I feel safe assuming strict accounting principles were adhered to. of course, I wasn't there, and must rely on the facts as I find them. When I return home I'll list each audit report by year and model. Meanwhile, maybe your "research" will turn up additional facts. For 1906 I prorated out Models C, B and F, so the estimated number of cars sold increased. The total dollars profit remain the same, just a change in the way I estimate the number of cars sold. I only had March through September actual sold numbers. This worked fine for Models N and K, since no Ks were sold until April 06 and no Ns until July 06. Thank you for sharing your research and findings. I'm glad I could be of a small help. Note, I believe one of the major reasons the Model N did not show much of a profit during 1906 was the low price of $500. While the goal of making and selling a $500 car was great -- it was just a little premature. It was not until 1914 with the help of mass production and a lot more sales that Ford was able to offer the Runabout for $500 and the price continued to drop so in 1915 the touring listed at $490 and the runabout $440. When Ford increased the price of the Model N from $500 in 1906 to $600 for 1907 he eliminated the 28 x 2 1/2 double tube tires and wheels that came standard on the $500 N. Most folks in 1906 had spent the additional $50 to purchase the Model N with the optional 28 x 3 clincher wheels rather than the 28 x 2 1/2 style wheels and tires which meant it was really a $550 car. Of course increased production also helped with the profits -- but in this case I believe increasing the price was the most important part. From some information I remember reading about Flanders, who helped set up the production for the Model N Runabout, he had discovered that Ford had estimated to low of a price for the car. [Note Ford had estimated too light of a frame for the initial Model Ts and that is why they have a fish plate reinforcement added to approximately the first 2500 frames. It happens sometimes.] If Ford had not increased the price, and instead kept the original $500 price with all the 1907 costs (including the more expensive tires) instead of $75 profit per Model N in 1907 I believe it would have turned out to be approximately $25 profit per car. [I.e. at $500 and all the rest being equal he would have lost $25 per car in 1907. But the $500 car had only the 28 x 2 1/2 style wheels which he charged $50 less than the 28 x 3 clincher wheels. He would NOT have sold them for long at a $25 loss but instead would have much more likely said, it is $500 with the 28 x 2 1/2 tires and wheels or $550 for the 28 x 3 clincher tires and wheels as he did for the 1906 cars. In that case he would have made approximately $25 profit per car. But the 28 x 3 wheels were a much better way to go and the car was selling great. So Ford could increase the price and still sell as many cars as he could produce at $600 giving him the $75 profit per car then if my math is correct [when will I learn to never do math in public?] we have $75 x 712 for $53,400 of potential profit. That would have been about 1/2 of the $102,314 profit the Model K brought in rather than the $1,661 dollars the $500 Model N brought in. See below for some remarks about Ford Manufacturing and their potential manipulation of the prices. The major take away is the Model K was a not only a good seller but the primary profit maker in 1906 and solid profit maker in 1907 and produced more profits in 1908 than the Model N Runabout, Model R Runabout, and Model S Coupe assuming your numbers are close to representative. And yes more than the T � but I do not think the regular T sales had gotten under way yet. Note Trent's numbers were sales by month. Would you please share or re-share the months you are using in your 1906, 1907, & 1908 figures (FY Oct 1, 1906to Sep 30, 1907 etc. or some other range?) There are some minor questions about some of the numbers, i.e. you only show 2 Model Ts sold in 1908 and that makes sense for a Fiscal Year of Oct 1, 1907 to Sep 30, 1908. And those would not have been normal production Model Ts quite yet. Again thank you for tackling this and for working hard to add to the information as well as to set the record straight about what happened during the 1906-07-08 time frame. Oh to have a little more time to pursue things... fascinating times. Clearly some of the "accepted facts of the past" were wrong and/or misrepresented. Thank you for taking the time to discover that and share it with us. Thank you for the interesting and enlightening information. I've seen initial press in which Ford was claiming they would sell the Model N for $400 to $500. Then, as we know, they settled on $500. As you pointed out, the appearance was that Ford raised the price $50 while giving preference in orders to buyers who chose the 28x3 tires, so the price became $600 (due to $50 in tire "upgrade" and $50 price hike). Ford press releases claimed the price increase was due to higher raw materials (that may have had some truth or not?). Below are the three documents I used to arrive at the numbers above. Unfortunately, for 1906, the Ford Gain/Loss report did not list the number of cars sold (by model), but did list the gross revenue (sales). I took a month where I knew the number of cars sold (thanks to Trent's database work) and was able to come up with a "per car" value, then divide out the year end numbers above to come up with an estimated cars sold. Probably not too important since Models B, C and F were not big profit generators anyway. In a bit, I'm coming back to this, and look at something I noticed before, but haven't heard discussed on the forum yet (although it probably has). Thank you for the additional information. From the scans -- we see 1907 & 1908 are for the year ending Sep 30. From which we are looking at the Fiscal Year Oct 1 1906 to Sep 30 1907 etc for both of those years and we assume the same for the 1906 year. I believe the profits shown by Rob are from the Ford Motor Company records. Therefore they would not reflect any profit or loss to the Dodge Brother's Company as it was a separate legal company. You are correct that Ford Motor Company paid both the Dodge Brothers Company as well as the Ford Manufacturing Company. In the case of the Dodge Brothers, they received a profit when they sold the parts to Ford and when Ford sold the car. In the case of the Ford Manufacturing company all the current Ford Motor Share holders �except� Malcomson were also share holders in the Ford Manufacturing company. It was a shell game of sorts and �could have been used� to siphon off the profits from Ford Motor Company and have the profits appear within the Ford Manufacturing Company rather than within the Ford Motor Company. In the case of the Ford Manufacturing -- I'm 99% sure there would be a legal battle if someone tried to do that today. Technically Ford Motor Company could purchase the parts from the Ford Manufacturing company and not make any profit on the sale of the car but the stock holders with the exception of Malcomson would receive their profits through the Ford Manufacturing company. And clearly that threat or maybe even that actual action was one of several methods used by Ford to encourage (or as some say squeeze) Malcomson to sell his shares and leave the Ford Motor Company. 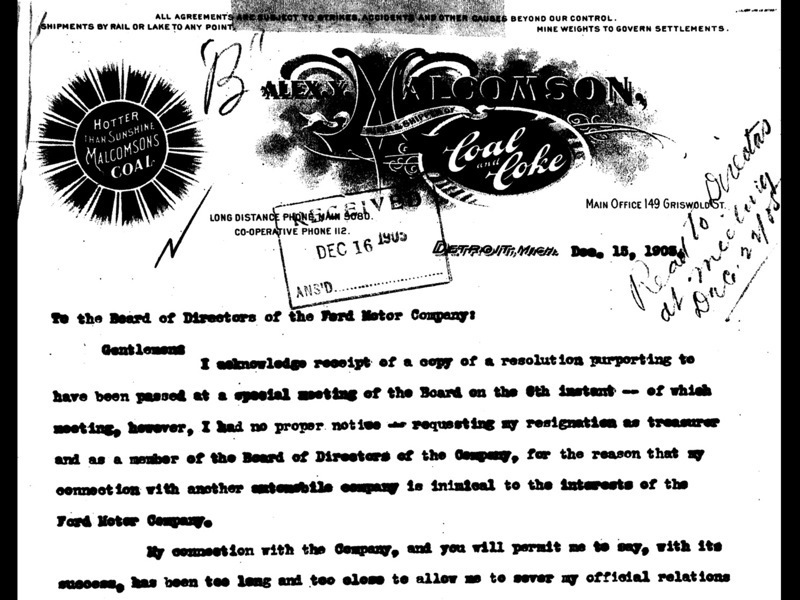 About 7 months after Malcomson was gone Ford Motor Company absorbed (bought out) the Ford Manufacturing Company. While I think the Ford Manufacturing Company could have been used to siphon the profits from the Model N through the sale of the parts they produced for the Model N � I do not know if they really did that or if it was a threat that was not executed. Not Malcomson left during the first month of Model N Runabout sales which was Jul 1906. Robert Casey in his book �The Model T a Centennial History� on page 14 stated that Ford and others formed Ford Manufacturing Company in Nov 1905. That they did it so they could �eat up most of the Model N profits.� But on the next page Casey makes the statement, �That left the Motor Company to survive on whatever income the slow selling Model K generated. The revenues were so meager that Malcomson and his supporters would see no dividends at all.� [Hap again] It would be nice to know if the Ford Motor Company did or did not have dividends for the 1906 FY quarters. I.e. if Casey was correct that no dividends were issued then he is more likely to be correct about the Ford Manufacturing Company actually �eating up the profits.� It would be nice to know how the $102,314 profit on the Model K sales as well as other profits from the other cars were used. Was there actually no dividend issued to share holders? I�m sure it would be less than the $100,000 dividend that had been split between the share holders for the first year of Ford Motor Company (ref page 8 of Bruce McCalley�s book). I would think that the records Rob has been reviewing might be able to verify if dividends were or were not given and if given how large of a dividend they were. And note the timing of Malcomson�s departure in the last paragraph of this posting. He was gone one month into the first sales of the Model N in Jul 1906. So did the Ford Manufacturing Company �set the prices� so the Model N Runabout only produced a $2 profit per car in 1906? Or were there other major reasons? I.e. was the $500 estimated cost that was publicized at the Jan New York Auto Show long before the actual production began just too low of an estimated cost? Or some combination of issues? There is always more to learn. 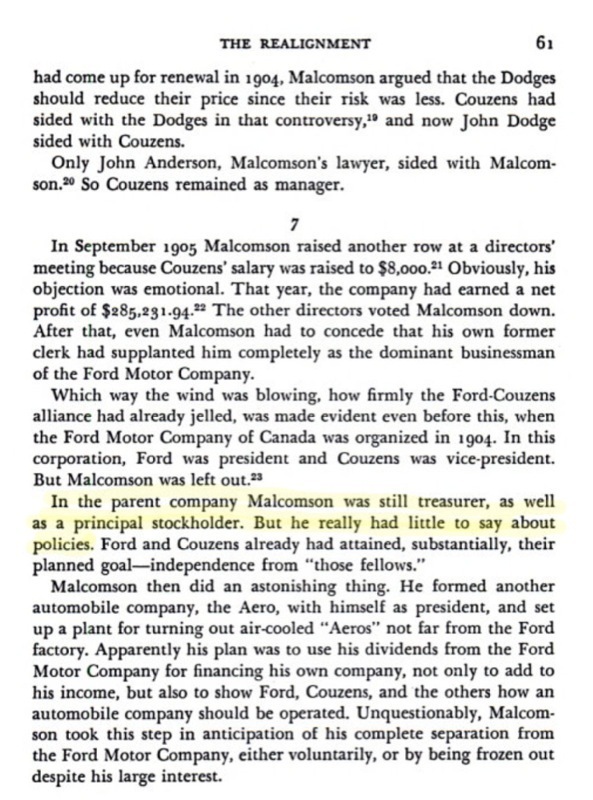 One thing we do know is that Malcomson agreed to sell his shares in Ford Motor Company and according to Robert Casey�s book on page 16 Malcomson sold out in Jul 1906. But it was not until May 1907 that the Ford Manufacturing Company was sold to Ford Motor Company. So we see that Malcomson left in Jul 1906 and according to Trent Boggess numbers those 712 Model Ns listed by Rob were sold in Jul, Aug, and Sep 1906. So was the $2 profit per Model N in 1906 FY the result of the Ford Manufacturing Company setting prices or some other reason? We may never know. But for the next 7 months the Ford Manufacturing Company along with other companies continued to supply parts for the Model N Runabout. The price was raised $100. The 28 x 2 1/2 wheels and tires were replaced with the more expensive 28 x 3 inch wheels and tires and the profit was now $75 per car for 1907 sales. Keep those facts, theories, and questions coming. Thank you for the contributions. It's wonderful to have a thoughtful discussion about an exciting time in Ford history. I'll go back and check, but the number and amount of dividends were "dizzying" the first few years of Ford Motor Company. The shareholders were awash in dividends, and I'm sure every shareholder felt they had found the goose that was laying golden eggs by the dozen, and I would think most would not have wanted to cook that goose. I believe A. Y. Malcomson's initial out of pocket (cash) investment was about $7,000 (not promisory, but actual cash, again not sure, but I think Ford Mo Co was capitalized with about $28,000 total). When he finally settled with Ford Motor Company and Henry Ford, letting his shares go in about July 1906, he received $175,000!!!! This in addition to thousands of dollars in dividends! Somehow, history has led us to believe Henry Ford "forced" A.Y. Malcomson to sell his shares at a discount. However, I saw a 1906 news report (can't put my hands on it now) in which the reporter questioned the legitimacy of Malcomson receiving so much money with such a small investment only three years earlier (heck of a return). Another thought. As Hap mentioned, Ford Manufacturing Company was incorporated in late November 1906. On December 5th, Ford Motor Company board of directors held an emergency meeting to discuss the news that Malcomson was starting a new auto manufacturing compnay. The ink was hardly dry on the incorporation papers for Ford Manufacturing Company, and Malcomson was "out of the closet", and out of favor with the entire board of directors. They (board) immediately drafted a letter and sent it to him (Malcomson) and placed it in the minutes file requesting his immediate resignation from the board. From that point on, A. Y. Malcomson had no influence whatsoever on Ford Motor Company. Another explanation for the formation of Ford Manufacturing Company that someone told me (can't recall who, maybe they'll step into this discussion) was that the second company was formed in case the Selden Patent suit went against Ford Motor Company. Then there would be a separate and protected manufacturing (not production) company to fall back on. I don't know if that's plausible, but maybe possible. As for "hiding profits", again, before the first model N or K were produced (other than the prototypes), Malcomson was out. When contracts were negotiated for Model N and K production, Ford Manufacturing was contracted to produce the chassis for $205 (I need to check my papers, about that amount) and Dodge Brothers were contracted to build the Model K chassis for $437 per. Ford Manufacturing was not "siphoning off" much profit with that amount. Another thing to consider, John Dodge was Vice President of Ford Manufacturing. Manufacturing, Ford Company, and Dodge Brothers were heavily intertwined, sharing board members, shareholders and probably shifting work and jobs between each other. I find it difficult to believe any one of the three were doing anything improper or "shady" with all the moving parts so closely involved. We modern plant in late 1905, and were producing cars from the plant by April 1906. It's the same plant Hudson later occupied, and is standing empty (I believe) in Detroit today. Look where Ford Motor Company is going with these two categories. I'm sure someone has thought of this before, but look at the potential these numbers present. If we were a Thomas or Peerless (or name the company), these numbers don't mean much. In other words, if your building a few hundred to a few thousand cars a year, these columns don't mean much in revenue (parts and sundries, or accessories). But if your Henry Ford and James Couzens, and you plan on building 25,000 cars next year (1909), and 250,000 in five years, these numbers jump out at you (or they do at me). I suspect James Couzens, Henry Ford and others at Ford Motor Company saw this and realized they would make more from parts than most manufacturers would make from sales! Just think it, if you are making 500,000 cars a year, keeping the cars on the road (parts and accessories) may be worth more than the actual sale of the car (or certainly as important). How many other auto makers would have seen this in 1906 or 1907? Maybe Buick, GM in a few years, but not many. Maybe there has been work on this area, but if not, it would be an interesting trend to follow. The ALAM would not allow Ford as a member because Ford did not manufacture cars. Ford was only an assembler prior to the introduction of the Model N.
When Ford began building the Model N at his Ford Manufacturing subsidiary, the company did qualify for ALAM, but Henry had decided by that time to fight the Selden patent rather than pay royalties. See the quite interesting book "Monopoly on Wheels" for the full story. Hap is correct, we do know that Malcomson was forced out by the shareholders, led by Henry Ford, forming the Mord Manufacturing Company. This is the most significant event in Ford history for 1906. Henry Ford was never in charge of his destiny, always being subject to John Gray or James Couzins prior to the departure of Malcomson in mid 1906. While it is significant that Malcomson was an investor in Aerocar, the more important result of the ouster was Ford could concentrate on low priced cars and not have to build expensive, limited appeal large cars. Sorensen by this time was in charge of the pattern making department, reporting directly to Henry Ford. There are a number of first person conversations between Henry Ford and Sorensen that tell a story that cannot be found in any other place as easily. Rob has provided a ton of research over the past 18 months that in every possible way validates Sorensens book. Well done sir! In November 1906 Charles Sorensen is 26 years old and has worked at Ford as a pattern maker for two years. With over 300 employees at FMC, I do not believe Charles Sorensen is part of the "inner circle" of Henry Ford nor the Board of Directors, where decisions were made in private (as of 1906). I do not envision Henry Ford sharing his intimate business plans with the young employee at this point in time. While Mr. Sorensen may say it's so, I don't believe it. I do believe that Henry Ford was a private person who probably shared his business and personal dealings with few, and probably in small doses. Because someone writes something years (decades) after the fact does not make it so. I do believe there are shreds of truth, along with "blended" memories and even fabrication when people decide to write their memories decades later. I would like to know how A. Y. Malcomson was "forced out by the shareholders"? He was asked to resign his position on the board of directors, and there is no doubt there was open friction between he and the board when he formed a competing company. However, there was no way to "force" a stockholder to relinquish their ownership in a company. Ford by laws did not have a provision (non compete) that I'm aware of, that allowed FMC and the board to "force" or take away Malcomson's shares. That was done (finally, six months later) by Henry Ford negotiating a price with A. Y. Malcomson to purchase his shares, at a tremendous increased value. From the biography "Independent Man: The Life of Senator James Couzens"
Another original, Bennett, also writes in his memoirs that A.Y. Malcomson had virtually nothing to do with the day to day operations of Ford Motor Company. I choose to believe these two men who were in the board and shareholder meetings, and had an intimate business relationship with Henry Ford at this time (1906/1907). My suspicion has long been that while Malcomson was an irritant, he was not a "driving force" capable of forcing Henry Ford to design and produce cars against his will. That's my opinion (not fact) and I've laid out vast amounts of evidence to support this position. Ford Manufacturing may have been formed as leverage against a future battle with Malcomson, it may also have provided insulation against a Selden Patent setback. Unfortunately, non of the principles wrote (that I'm aware of) that the exclusive purpose of FMC was. Furthermore, if Malcomson did exert so much control over Henry Ford and the board of directors, wouldn't he have simply disallowed any contracts with Ford Manufacturing Company, killing it on the spot? I should add, I'm no "Ford Manufacturing Company" expert by any means. I do have a copy of Ford Motor Company board of directors minutes, and they have given some insights I would not otherwise have had the opportunity to gain. First, A. Y. Malcomson's letter in response to FMC's letter requesting he resign. This letter says in part "special meeting of the board on 6th (FMC special board meeting, 6th of December, 1905). Malcomson lay's out the reasons why he should not resign his officer position on the board. This is not a request or demand to relinquish his stock only his board position. FMC board meeting on the 9th of January 1906. Two excerpts are included. The first portion approves Ford Mo Co renting space at the Dodge Brothers new location. I'm including this excerpt to point out how "inter tangled" Ford Motor Company, Dodge Brothers, and Ford Manufacturing were. John Dodge is the Vice President of Ford Manufacturing at this time. 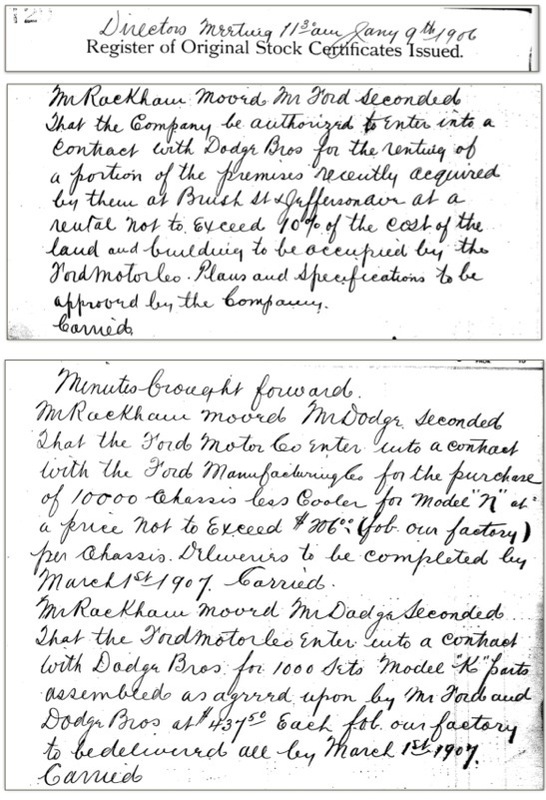 The second excerpt covers the contracts for Model N and Model K chassis contracts. The board approves purchase of 10,000 Model N chassis from Ford Manufacturing, at $206 per chassis. Also approved is the Model K chassis from Dodge Brothers (1,000 chassis, the number of Model K, give or take, that are eventually produced) for $437.50 each. Meanwhile, A. Y. Malcomson sells his FMC stock during the summer of 1906 for $175,000. Ford Manufacturing Company is purchased by Ford Motor Company by 1907, for over $500,000, and the rest is "history." This is what 40 seconds meant in September 1905. A world record. 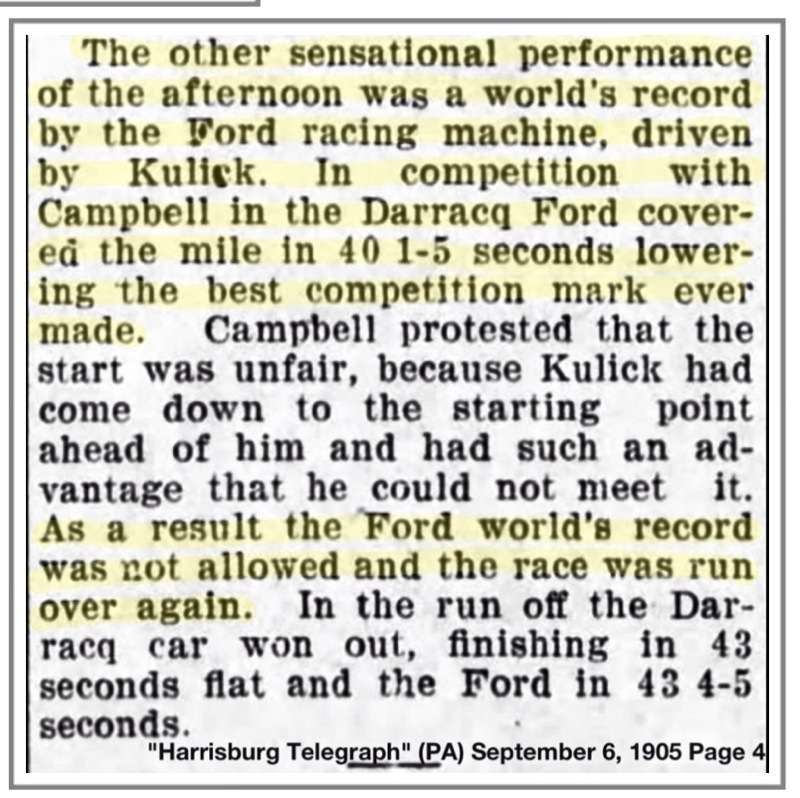 However, because Cambell/Darracq filed a protest, that 40 seconds didn't count, and was not a world record. So why is 40 seconds not a significant number?